With the release last month of Penfolds range of premium wines it seems like a good time to have a look at some of the earlier bottles available from this company. I won’t delve into the history of Penfolds as there are plenty of resources online already dealing with the subject, e.g. here is the Wikipedia entry. Most collectable Penfolds bottles date to the 1910s-1920s (except of course that many Penfolds wines such as Grange are themselves collectables!). Claret shape: Penfolds were predominately a fortified wine producer in the early 20th century but these bottles would have contained table wines. Below is a range of colours and ages. 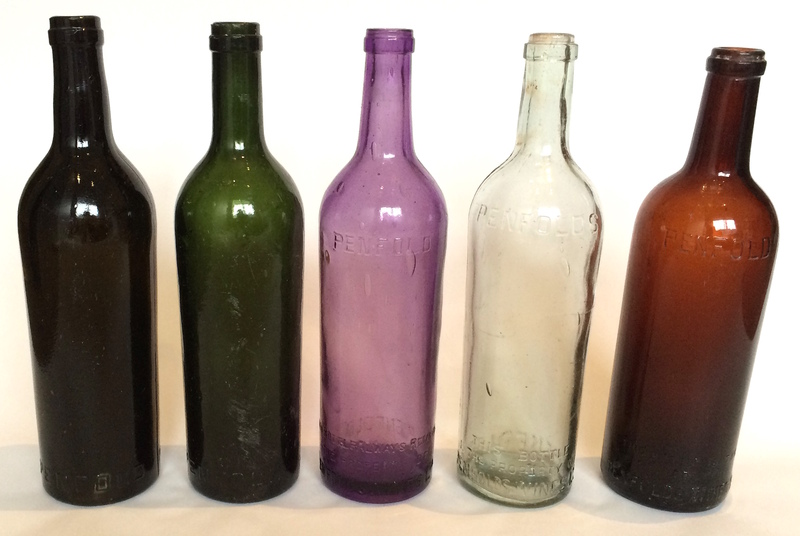 The clear glass bottles contained whites and the darker green or amber bottles the reds. 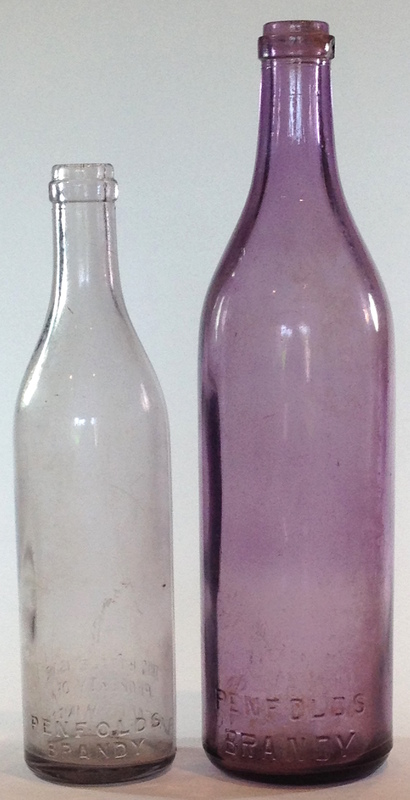 The amethyst bottle in the middle would have started out as clear glass but Manganese Dioxide was widely used as an additive in glass to remove the green tinge and create truly clear glass. However with years in sunlight this compound itself changes and gradually turns the glass amethyst or purple. All these bottles are embossed “The property of Penfolds Wines Ltd” in some form near the base and then variously have “Penfold” or “Penfolds” at the other base edge and/or shoulder. The amber bottle on the right is close to a modern day style and dates to about 1930. Fortifieds: Like the Claret shapes these come in a range of colours (by the way I’ve only shown a small selection of both types). These are embossed similarly to the Claret types. 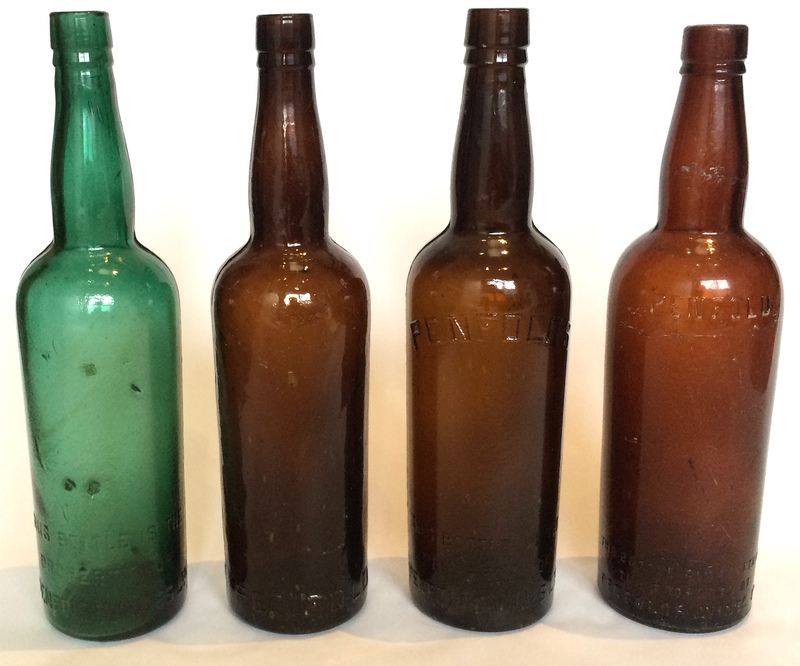 Note that the two bottles to the left have the same base mark which shows the mould for these was made in 1917. As they are quite crudely made collectors often think these types of Penfolds bottles are earlier than they truly are. An important note here is that the company “Penfolds Wines Ltd” as embossed on most of the bottles found was formed in 1913. Again the bottle on the right is the latest in this series and of much more regular design dating to the early 1930s. Brandy: Another major production of Penfolds were various styles of Brandy. Below are typical brandy bottles in Amethyst of late 1920s vintage. The other bottle is a nice Hock style but with Old Liqueur Brandy label with vintage 1914. This bottle however is a mid 1920s era bottle which would fit in with the release of a nice aged Brandy. 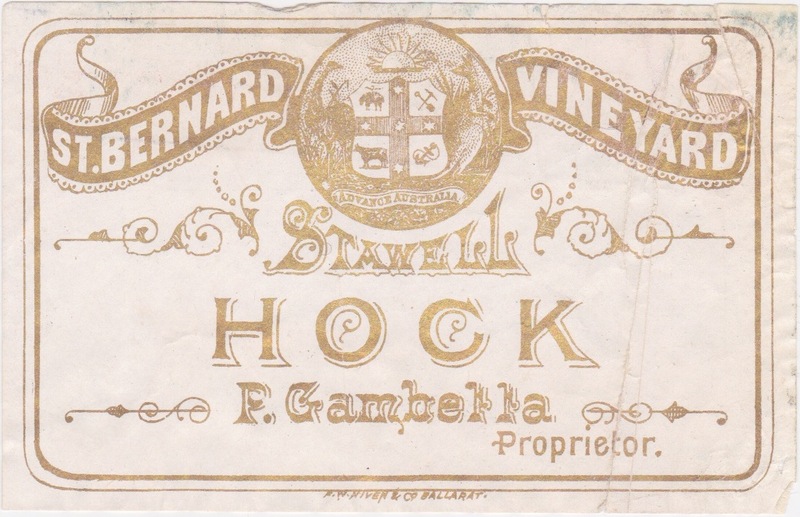 Hock shape bottle with Penfolds brandy labels, vintage 1914. Large & Small Penfolds Brandy bottles. Circa 1920s. Amongst the bottle styles shown above are numerous other variations. In general the Penfolds bottles are pretty cheap even for really attractive varieties – they were an enormous company and their bottles are quite numerous. Original labelled varieties are very rare. A very attractive display can be created of Penfolds bottles along with their enormous range of advertising, ephemera and so forth. Actually below is an account of the second big award given to Australian wine although it mentions the first one awarded to Gregory Blaxland as shown above. The Sydney Gazette & New South Wales Advertiser. 3rd August 1830. Page 2. Among the ‘ Papers in Colonies and Trade’ (pp. 133-135), is published the letter which Mr. BLAXLAND accompanied with his samples, to which the Society subjoin some further remarks of an encouraging nature. ” No. 1.— WINE FROM NEW SOUTH WALES. 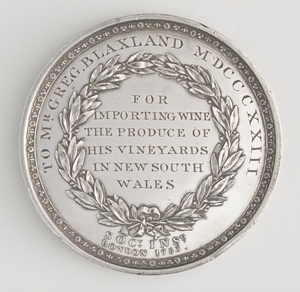 The GOLD CERES MEDAL was presented to GREGORY BLAXLAND, Esquire, of Sydney, New South Wales, for Wine, the produce of his Vineyard in that Colony. 75, Old Broad Street, Feb. 25,1828. ” SIR, – I have to request that you will lay be- fore the Society the enclosed bill of lading and other documents, respecting a pipe of wine, the produce of my vineyard in New South Wales last year, 1827, for which I beg to make my claim for the gold medal offered by the Society. ” I have also sent for their inspection samples of the two best half pipes, the one in pint bottles from No. 1, the other in quart bottles from No. 2. From experience, I find, that as the vines become more matured by age, the wine in every situation is of a much better quality. Before I make further observations on the quality of the two samples, it will he necessary to state, that the vineyard is situated on the side of a very steep hill. The cask No. 1 was made from the grapes which grew on the top of the hill ; they were the first ripe ; the soil thin and dry, totally unfit for agricultural purposes ; the other, No. 2, from grapes that grew on the centre of the hill, on a deeper and richer soil ; they were ripe in about a week after the first. More wine was made from the grapes at the bottom of the hill, where the soil is rich and deep, but it was of a very inferior quality ; which rich deep soil, from the experience I have had in the Colony, I consider totally unfit for the production of wine of value for commercial purposes, unless it is made into brandy soon after it has done fermenting, as it appears neither to possess flavour, nor the property of keeping long in the cask free from acid. I am, Sir, &c. &c.
” GREGORY BLAXLAND. ” A. ATKIN, Esq. ” It appears from the custom-house documents produced before the Committee, that Mr. BLAXLAND shipped at Sydney, on the 5th of February, 1827, three half pipes of Colonial wine, the produce of his own vineyard ; ten per cent of French brandy having been previously added to it, in order to enable it to bear the voyage. Of the two half pipes, which, on their arrival in the Thames, appeared to be the best, Mr. BLAXLAND sent samples in bottle. ” The grape from which the whole was made is a small black cluster grape, supposed to be a seedling from the claret grape, as mentioned in Mr. BLAXLAND’S letter, printed in the 41st volume of the Society’s Transactions. We hope this will furnish an additional inducement to our settlers to form vineyards, and to aim at the production of wine. Once popular on sideboards and behind bars across Australia, decanters were a prime way to advertise alcoholic beverages of all kinds. Most large Australian wine companies from the 1890s to the 1930s produced this kind of advertising glassware with a few still producing these items into the second half of the twentieth century. The style of manufacture suggest most of these decanters were produced in England or France. 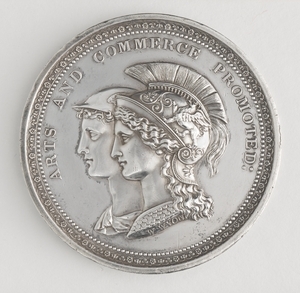 It is likely however that the advertising was then added locally usually in one of three styles: Acid etched, engraved or as applied enamel lettering. 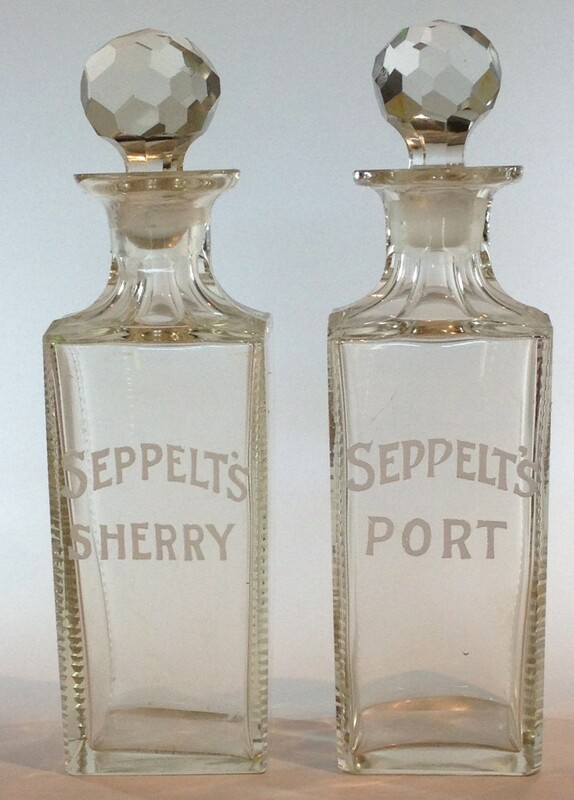 To highlight the advertising many of the engraved or etched decanters had gold or red paint added to the lettering. While the enamelled decanters usually just have white lettering other colours are also sometimes seen such as red, black and blue. Gramps Orlando Wines Decanter. Enamelled decoration. c1920s. As you might expect one of the difficulties of collecting decanters is finding examples with their original (or at least fitting) stoppers. On the plus side the price of these rarely exceeds a good modern decanter and with a bit of a clean can make a great talking point the next time you serve a nice old wine! Penfolds Port Decanter. Engraved with gilt lettering. c1940s-1950s. 26 oz Green, claret shaped bottle. 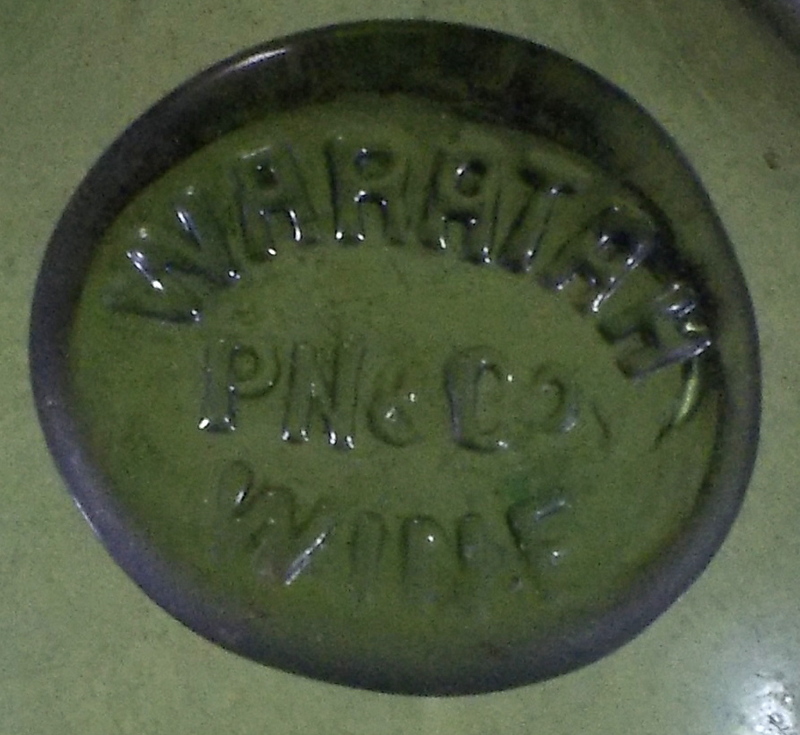 Applied seal to shoulder: Waratah Wine, PN & Co. Circa 1895-1898. A Spirit merchants licence was granted to the firm of Peel, Newman & Co, 29 O’Connell Street, Sydney in November 1895. Over the next year or so they advertised their “Waratah Brand” Wine in The Catholic Press (Below is an example from 7th December 1895). Notice is hereby given that the PARTNERSHIP hitherto existing between the undersigned, THOMAS PARK PEEL and CLAUDE EDWARD LUSCOMBE NEWMAN, under the name or style of Peel, Newman, and Co., at No. 29 O’Connell-street, Sydney, in the trade or business of Wine and Spirit Merchants, has this day been DISSOLVED by mutual consent. The said THOMAS PARK PEEL will pay all the debts and liabilities due by, and receive all the debts due to, the said late firm. Dated this fifth day of December, 1898. Witness to signature of Claude Edward Luscombe Newman – HAROLD RAWLINGS. With reference to the above notice, I have this day taken Mr. JAMES BOWEN PAIN into Partnership, and the business will from henceforth be carried on at the same address, under the name, style, or firm of PEEL, PAIN, and CO. The company did indeed continue as Peel, Pain and Co., and there are some advertisements mentioning the Waratah Wine brand continuing but as yet no sign beyond about 1901. Something for a bit further study. The bottle it should be mentioned is extremely rare. The example pictured is the only one currently known to bottle collectors but perhaps there is a bottle or two lying in a forgotten cellar somewhere? There is no mention in any of the advertising as to the origin of the wine itself. The Hunter Valley is the likely source but there were significant vineyards elsewhere in New South Wales that could also have been providers. Evening News, Sydney Saturday 9th January 1897. p2. The Maitland Weekly Mercury Saturday 17th April 1897, p16. The Sydney Morning Herald, Friday 9th December 1898, p1. Glenlinton Vineyard, Whittlesea, Claret. Proprietor: R. E. Dawson. 46 Prize Awards. Firstly, the bottle itself here looks to be about 1900s-1910s. 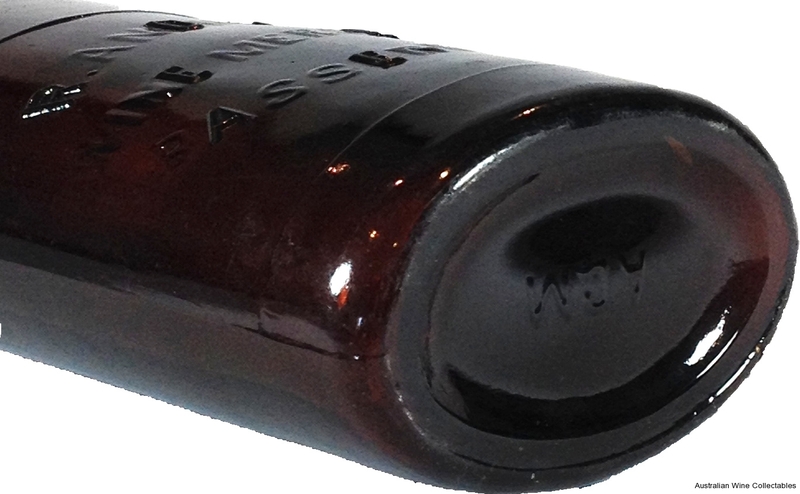 However given bottles were commonly re-used for years during the early 20th century the label could be anything up to the 1930s. Trawling the records might lead to a rough idea when Glenlinton had in the vicinity of 46 Prizes as stated on the label! Robert Ernest Dawson bought the Glenlinton property in 1902 and sold in 1937. Although the news reports found so far are brief it appears that the vineyard expanded pretty strongly until the late 1920s. Undoubtedly the depression slowed business and although only a guess, the death of Dawson’s eldest son Leigh in September 1929 at the age of 26 could well have derailed any succession planning. News reports show that 1935 was the final vintage. R. E. Dawson described as an ex vigneron died at Black Rock on 16th December 1945. During his life he had also been appointed as a Magistrate in 1910, and to the Royal Agricultural Society in 1935. The Argus (Melbourne), Saturday 10th April 1926. Page 18. The vintage of Mr. R. E. Dawson’s Glenlinton vineyard promises well, and picking should commence shortly. The wine from Mr. Dawson’s cellar has gained many prizes, and is sought after by many on account of its good quality. The Australasian (Melbourne), Saturday 8th May 1926. Page 15. Mr. R. E. Dawson’s Glenlinton vineyard is situated near Whittlesea, and covers a little more than 50 acres. Each year Mr. Dawson plants out fresh areas and has replaced some of his fruit trees with vines, the returns from which are more profitable. More cellar accommodation has recently been provided. Picking for the season is now in full swing. …Mr. R. E. Dawson, of “Glenlinton” Vineyard, supplies the wines, and is always prominent in the wine section in connection with the Royal Show. The Advertiser (Hurstbridge), Friday 12th April 1929. Page 4. WHITTLESEA: All hands are busy taking off the crop of grapes at the annual vintage at Mr. R. E. Dawson’s “Glenlinton” vineyard at Humevale. 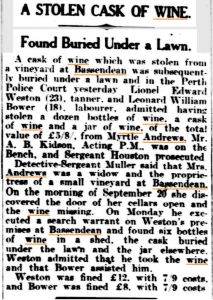 The Advertiser (Hurstbridge), Friday 25th April 1930. Page 8. The vintage at Mr. R. E. Dawson’s Glenlinton vineyard at Humevale is now in full swing. The prospects are good. The Advertiser (Hurstbridge), Friday 26th April 1935. Page 2. Humevale: The continued rain is delaying vintage operations at the Glenlinton Vineyard. About People. General satisfaction is expressed in the Whittlesea and Arthur’s Creek district at the appointment of Mr R. E. Dawson, J.P. of Glenlinton Vineyard, Whittlesea, to the council of the Royal Agricultural Society. Although Mr Dawson was appointed on the nomination of the Viticultural Association of Victoria to look after the interests of the vignerons of the State he has taken an active part in all local affairs for many years, having been president of the Whittlesea Agricultural Society, vice president of the District Football Association, and occupied several other leading positions. For some years he took an active part in the preparation of the Whittlesea district exhibit at the Royal Agricultural show and has been an annual exhibitor of wines at that show. He has a stud flock of Border Leicester sheep, and prior to the war was an exporter of apples to the English and German markets, so that he is a good all-round producers’ man. It is gratifying to the district that it has now direct representation on the governing body of the Royal Agricultural show. The last remaining vineyard in what may be termed the Lilydale belt within a radius of 30 miles from Melbourne was not pruned this year, and there is every indication that this vineyard, “Glenlinton,” Whittlesea, has made its last vintage. A well-improved, good grazing property, with vineyard of 40 acres, having an excellent reputation for the production of the best light wines. AUSTRALIAN MERCANTILE, LAND. AND FINANCE CO. LTD (Incorporating J. M. Peck and Sons) have been favoured with Instructions from R. E. Dawson, Esq., to offer as above Glenlinton, situate Humevale, 30 miles G.P.O., and within close proximity of Whittlesea railway station. Very nice homestead, beautifully situated, and constructed of concrete and W.B., containing 9 large rooms, large hall, wide verandah, sleep-out, E.L., H. and C. water, nice garden, water laid on; stables, sheepyards. and dip; all necessary outbuildings. Well fenced and subdivided into 14 paddocks, abundantly watered by 7 dams, 2 underground and 3 elevated tanks, windmill, &c.; 50 acres fallow, and about 80 acres sown down. 40 acres vines, extensive cellarage, complete wine making plant, and about 18,000 gallons of caskage, Glenlinton is celebrated as producing the best light wines, claret, hock, and chablis in Victoria of late years, exactly similar in climate and type to the famous Upper Yarra wines of 20 to 50 years ago. Whenever exhibited at the Royal Show, Glenlinton wine has been among the prize takers. There is always a good demand from wine merchants for the Glenlinton vintages, and Mr. Dawson at present has sold right out. This attractive property is for genuine sale, having been in present owner’s possession for 35 years, and is most adaptable for grazing and the raising of fat lambs; most desirable for a city man requiring a good country home, handy to Melbourne. I haven’t found a lot of background on this particular bottle but Robert Andrews died in early 1931 having apparently been in Western Australia since around 1910. His death notice mentions being in Bassendean for a “few years”. The bottle itself is mid-late 1920s vintage. 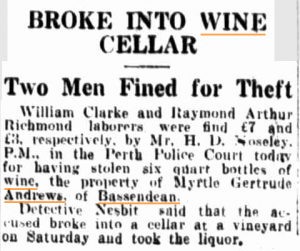 On the 2nd July 1929 in the West Australian, Andrews name (and occupation as a vigneron) appears in a list of petitioners to have Bassendean granted a new liquor licence as at that time there were no licensed premises in the area. After Robert Andrews’ death his widow Myrtle continued the wine making business. Although the only references I’ve yet found are about thefts of wine that took place from the cellars. 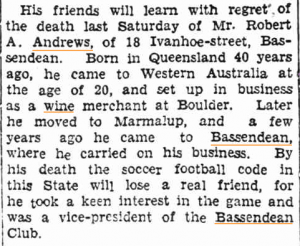 Death notice for Robert Andrews, The Daily News (Perth), 2nd February 1931. The Daily News (Perth) (12th June 1933). SOURCE: Trove Digitised Newspapers & More.